German Chancellor Angela Merkel has said Russia will face escalating EU sanctions if it does not take steps to ease the crisis over Crimea. Mrs Merkel, speaking ahead of an EU summit in Brussels, said the current political situation also meant the G8 effectively no longer existed. Tensions remain high in Crimea after its leaders signed a deal with Moscow to split from Ukraine and join Russia. Pro-Russian forces took over at least two military bases there on Wednesday. Ukraine’s navy commander, Serhiy Hayduk, was detained, but has now been released. Crimean leaders signed a treaty with Moscow on Tuesday to absorb the peninsula – an autonomous republic in southern Ukraine – into Russia, following a referendum which the West and Kiev say was illegal. The treaty has now been approved by Russia’s lower house of parliament – the Duma – and is expected to be ratified by the upper house on Friday. Speaking ahead of the vote in the Duma, Russia’s Foreign Minister Sergei Lavrov described possible sanctions as “illegitimate” and “not based on international law”. Mr Lavrov said the treaty to absorb Crimea into the Russian Federation would “be a turning point in the fate of the multi-ethnic peoples of Crimea and Russia, who are linked by the close ties of historical solidarity”. He reiterated Moscow’s position that the annexation is necessary to protect ethnic Russians from “nationalists, anti-Semites and other extremists on whom the new [Ukrainian] authorities depend”. 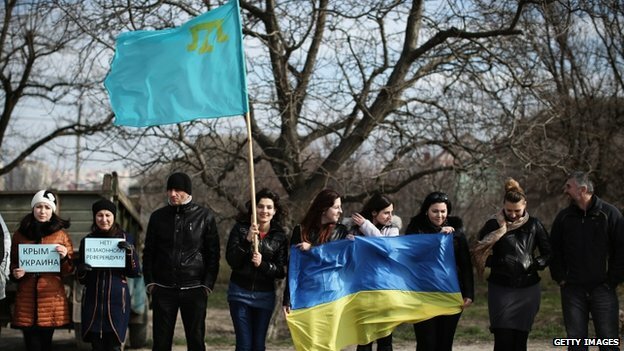 In a resolution on Thursday, Ukraine’s parliament said the country would “never and under no circumstances end the fight to free Crimea of occupants, no matter how difficult and long it is”. Western leaders have denounced Russia’s actions in Crimea as a violation of Ukraine’s sovereignty and a breach of international law. The EU has already imposed sanctions on 21 people connected to Moscow’s intervention in Crimea, and is expected to discuss expanding the sanctions when it meets on Thursday to include political and military figures close to Russian President Vladimir Putin. 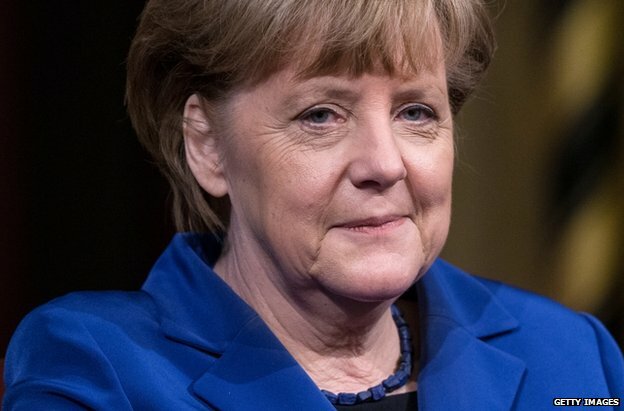 Speaking in Berlin, Mrs Merkel said the EU would “make clear that we are ready at any time” to increase sanctions against Russia “if there is a worsening of the situation”. The EU would also, she said, “draw consequences for political relations between the EU and Russia, as well as for relations between the G7 and Russia”. 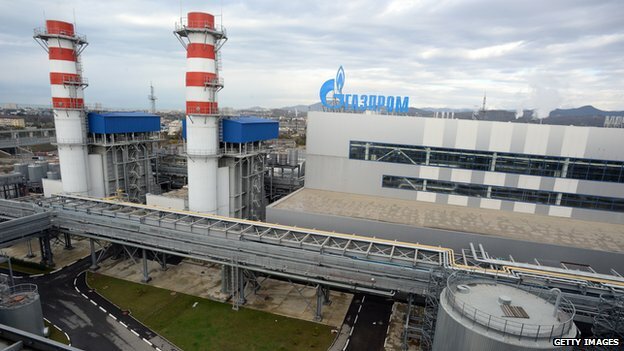 The G8 – comprising seven of the world’s leading industrialised nations, and Russia – is scheduled to hold a summit in the southern Russian city of Sochi in June. But Mrs Merkel said it was “obvious, as long as the political context for such an important format like the G8 does not apply, as is the case at the moment, the G8 doesn’t exist anymore, neither does the summit nor the format as such”. The BBC’s Matthew Price in Brussels say some believe the first stage of a seismic shift in EU-Russian relations is taking place. But this will take years, not days, to come about, he adds, and if the leaders are serious they will need to reduce Europe’s reliance on Russian gas. The US has also ordered a freeze of assets and travel bans on 11 individuals, and has said it is considering expanding these. The crisis comes nearly a month after Ukraine’s pro-Russian President Viktor Yanukovych was replaced by Western-leaning interim authorities. 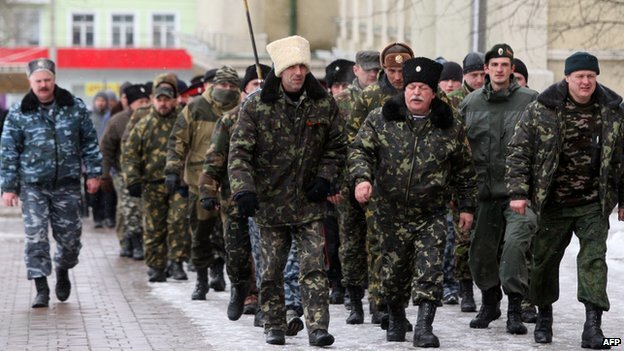 Pro-Russian troops took control of Crimea in late February. At least two bases – in Sevastopol and Novo-Ozyorne – were taken over by pro-Russian forces on Wednesday. Ukraine has said it is drawing up plans to withdraw its thousands of soldiers and their families from Crimea for their own safety, and redeploy them on the mainland. A number have already accepted Russia’s offer to change sides, but many are still in their bases refusing to surrender. The EU and US have announced travel bans and asset freezes against a number of officials from Russia and Ukraine. The moves follow Sunday’s referendum in Crimea, in which officials say 97% of voters backed breaking away from Ukraine and joining Russia. The individuals targeted by the sanctions are seen as having played a key role in the referendum, which Kiev, the US and EU deem illegal. 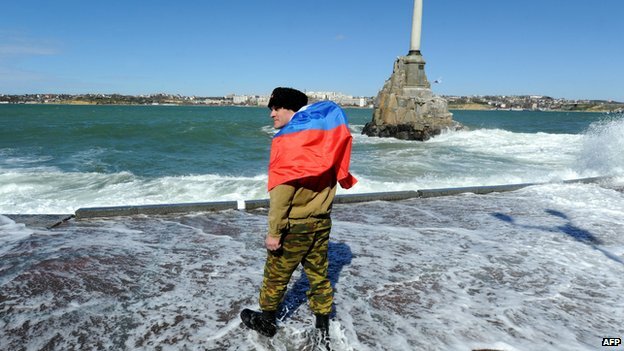 Pro-Russian forces have been in control of Crimea since late February. Moscow says the troops are pro-Russian self-defence forces and not under its direct control. The crisis follows the ousting on 22 February of Ukraine’s pro-Moscow president Viktor Yanukovych, who had sparked months of street protests by rejecting a planned EU trade deal in favour of closer ties with Moscow. US President Barack Obama said in a press conference that Washington stood “ready to impose further sanctions” depending on whether Russia escalated or de-escalated the situation in Ukraine. If Moscow continued to intervene in Ukraine, he warned, it would “achieve nothing except to further isolate Russia and diminish its place in the world”. The EU list of sanctions against 21 officials, which was agreed after a meeting of foreign ministers in Brussels, is expected to be published later on Monday. “We regret that Russia has so far not engaged in negotiations with Ukraine,” EU foreign policy chief Catherine Ashton said in a press conference after the sanctions were announced. UK Foreign Secretary William Hague told reporters the list was not “set in stone”. He said this depends on “how Russia reacts to the referendum in Crimea which has been a mockery of any real democracy, and how they are reacting to the possibility of discussions and direct negotiations with Ukraine over the coming days”. The US said it had targeted seven top Russian government officials and lawmakers and four Crimea-based separatist leaders with financial sanctions for undermining “democratic processes and institutions in Ukraine”. The officials include Sergei Aksyonov, the acting leader of Crimea; Dmitry Rogozin, a Russian deputy prime minister; and Valentina Matviyenko, head of the upper house of the Russian parliament. The ousted Ukrainian leader, Viktor Yanukovych, was also on the list. The EU has also shown its support for Ukraine by announcing it will temporarily remove customs duties on Ukrainian exports to the EU. Separately, the authorities in Kiev say they have recalled their ambassador to Moscow for consultation, over the situation in Crimea. Ukrainian Foreign Minister Andriy Deshchytsya has welcomed the EU’s decision to impose sanctions. “Comrade Obama, and what will you do with those who have neither accounts nor property abroad? Or didn’t you think of that?” Mr Rogozin wrote on Twitter. Monday’s sanctions came hours after Crimea’s parliament declared the region an independent state, following Sunday’s referendum. According to the parliamentary vote, Ukrainian laws now no longer apply in the region, and all Ukrainian state property belongs to an independent Crimea. The peninsula will adopt the Russian currency, the rouble, and clocks will move two hours forward to Moscow time by the end of March. The document approved by MPs also appealed to “all countries of the world” to recognise Crimean independence. The government in Kiev has said it will not recognise the results of the referendum. Russia earlier proposed the formation of an international “contact group” to mediate in the crisis and seek changes in the constitution that would require Ukraine to uphold military and political neutrality. But the authorities in Kiev have dismissed the proposal as “absolutely unacceptable”, Ukrainian foreign ministry spokesman Yevhen Perebynis told Interfax Ukraine news agency. Meanwhile, the parliament in Kiev has formally approved the partial mobilisation of 40,000 reservists and says it is monitoring the situation along the eastern border with Russia. Simferopol, Ukraine (CNN) — The pro-Russian government of Ukraine’s southeastern Crimean region declared independence Tuesday ahead of a scheduled referendum on whether to join Russia, ignoring international warnings that the vote won’t be recognized. In the regional capital Simferopol, pro-Russian militiamen guarded the airport and train station, some wearing armbands that proclaimed their allegiance to “the autonomous republic of Crimea.” Flights into the region from Ukraine’s capital, Kiev, were canceled Tuesday, while flights from Moscow appeared to be landing as scheduled. A guard at the railway station told CNN that he and his comrades were looking out for weapons being shipped in from the rest of Ukraine. Tuesday’s declaration from the Crimean parliament announced that if its population votes in favor of joining Russia on Sunday, it will ask the Russian Federation if it can join with Moscow. Almost immediately afterward, the Russian parliament announced it would debate whether to accept Crimea as part of the country on March 21. Ukraine’s interim government, backed by the United States and European powers, has said the upcoming vote is illegitimate. Yanukovych fled Kiev on February 22, after three months of protests against his decision to scrap a trade deal with the European Union and embrace closer ties with Russia. Less than a week later, armed men seized the Crimean parliament building in Simferopol and raised the Russian flag above it. Ukrainian government forces in Crimea have been surrounded in their bases by well-equipped troops wearing uniforms with no insignia — troops Western countries say are Russian but whom Moscow calls local “self-defense” forces. The move has effectively severed the strategic peninsula, which has an ethnic Russian majority, from the rest of Ukraine. U.S. and Western diplomats have urged Russia to enter into talks with Ukraine, but Russian officials have shown little interest. While the West is preparing sanctions against Russia over the standoff, U.S. Secretary of State John Kerry has told his Russian counterpart, Foreign Minister Sergey Lavrov, that “there is an off-ramp here,” State Department spokeswoman Jen Psaki told reporters in Washington. “Any discussion about the future of Crimea needs to take place with the new government of Ukraine at the table, engaged in it, participating in that conversation,” Psaki said. The United States understands that Russia has interests in Crimea, “but those interests in no way justify military intervention or the use of force,” she added. The U.S. House of Representatives Tuesday overwhelmingly approved a resolution condemning Russia for its military intervention in Ukraine and urging economic and other sanctions in response. In a 402-7 vote, lawmakers approved a nonbinding resolution stating that Russia’s action poses a “threat to international peace and security” and calling on Russia to remove “all of its military forces from Ukraine’s Crimean peninsula” other than those that are there in accordance with an agreement on operations of Russia’s Black Sea fleet. Lavrov said Monday that Kerry had postponed a face-to-face meeting with Russian President Vladimir Putin to discuss U.S. proposals, which Moscow has effectively rejected. The meeting would have marked the highest-level contact between the two countries since Russian troops took up positions in Crimea. OSCE monitors have been denied entry into Crimea by armed men several times since the crisis began. In a statement issued Tuesday evening, Russia’s Foreign Ministry cited Kosovo’s secession from Serbia — a move recognized by Western governments over bitter opposition from Serbia and its historical allies in Moscow — as precedent for the “absolutely legitimate” Crimean vote. “The Russian Federation will respect the results of the free vote of Crimea’s people during the referendum,” it said. Lavrov and Kerry spoke on the phone Tuesday, both sides reported. During the conversation, Lavrov said Russia “emphasized the need to respect the rights of all Ukrainians and all regions while looking for ways of solving the crisis, and the need to respect the rights of Crimea’s citizens to determine their destiny by themselves in accordance with the international law,” the Foreign Ministry said. French Foreign Minister Laurent Fabius also called the referendum illegal, tweeting on his official account Tuesday that sanctions against Russia over its intervention in Crimea could come as soon as this week. Sanctions would include asset freezes and visa suspensions, he said. And German Foreign Minister Frank-Walter Steinmeier said his government’s current relationship with Russia cannot continue unless the country heeds calls to calm the situation. “The people on the Maidan would soil and sleep and eat in the same place, it was worse than tramps,” he said. Meanwhile, a commander of the notorious Berkut riot police — disbanded after Yanukovych was ousted but celebrated as heroes in Crimea — denounced the February revolt in Kiev. “There are probably good-willed people who are concerned that their Slavic brothers and sisters are all of a sudden being subjected to fascism or Naziism, because that is what Russian TV is putting out,” Albright told CNN’s “Amanpour” program. “There are a lot of older people who probably remember World War II and the tragedies that took place in Ukraine, and so this is just pure, unadulterated scare tactics,” Albright added. “I’m not just the legitimate President, but I am also the head of the military. I’ve not stopped my responsibilities, I’m alive, I’ve not been left without my powers,” he said. Moscow has denounced the events that led to Yanukovych’s ouster as an illegitimate coup and has refused to recognize the new Ukrainian authorities, putting the two countries on a collision course over control of Crimea. The Black Sea peninsula has been part of Ukraine since 1954 but has strong cultural and historical ties to Russia, which has a large, strategically important naval base in the Crimean port of Sevastopol. Putin has said his government has the right to protect ethnic Russians living there. Politicians do not tread more carefully than Angela Merkel. She does not shoot her mouth off. She does not do rhetoric. She is not a hot-head. So what should one make of her reticence in the current crisis with Ukraine? So far she has confined her public comments to the less than bombastic “What is happening in Crimea worries us”, and stressing the importance of “preserving the territorial integrity” of Ukraine. She has talked to Russian President Vladimir Putin at least twice. In the second phone call, they agreed to maintain a dialogue. Those who know her way of operating say that Chancellor Merkel’s background as a scientist is apparent. He thinks, though, that the two have a fundamentally different approach. Dr Boehlke thinks President Putin’s is more emotional, with a sense of the weight of history and Russia’s historic role as a power, compared with her pragmatic focus on economies. This may help explain why, according to the New York Times, Chancellor Merkel told US President Barack Obama that Mr Putin had seemed like he was “in another world”. Her office has not commented on the alleged remark apart from saying that the conversations were “confidential”. The reported comment seems to have come from the American end and clearly the tone – or even if it was said at all – remains unclear. So Chancellor Merkel’s tactic seems to be to keep this continual dialogue open. According to Dr Boehlke, it is important that it is a person-to-person dialogue, a president-to-chancellor dialogue. Others in the West may ramp up the rhetoric but Mrs Merkel will damp it down, perhaps in a good cop/bad cop combination with other Western leaders. This sense that Germany is trying to give Russia acceptable options before the West as a whole wades in with sanctions seems to be underlined by what German Foreign Minister Frank-Walter Steinmeier said after meeting his Russian counterpart, Sergei Lavrov, in Geneva on Tuesday. They do seem to have the respectful relationship of old adversaries. In the past, they have not been warm and tactile with each other in the way, say, Mrs Merkel and US President Barack Obama were when he visited Berlin (before the revelation that his people were listening in on her phone). But that is not her way, or his. The two of them talk the same language – literally. President Putin speaks very good German, no doubt honed in his years as a KGB officer in Dresden. And Chancellor Merkel would at least have learnt Russian in school in the old East Germany (over which Agent Putin was keeping watch). For Mrs Merkel, too, the thought of war in Ukraine sharpens the mind more than it might in Washington or London. The country is only 10 hours’ drive from Berlin. Germany, Ukraine and Russia inhabit the same region of the world. Chancellor Merkel has involved herself in the politics of the region. She has maintained links with heads of state, including President Putin, but also with dissidents in both Russia and Ukraine – remember that the jailed Russian oligarch and Putin opponent Mikhail Khodorkovsky flew straight to Berlin when he was freed from his Russian prison. Chancellor Merkel has repeatedly raised the case of the jailed (now freed) Ukrainian dissident Yulia Tymoshenko with the government in Kiev. When the Ukrainian politician was released, Mrs Merkel was careful to “welcome her to freedom”, but not to endorse her as the country’s potential new leader. It’s true that the Russian and German leaders’ visits to each other’s country are not always happy. When President Putin came to Germany last year, he was confronted by bare-breasted female protesters with slogans on their chests. He seemed amused and shrugged it off. When Chancellor Merkel went to St Petersburg, there was a tiff when President Putin objected to a speech she was going to make at an exhibition of art taken by the Russians from German museums at the end of the war. Mr Putin said it was “hardly worth starting an argument now” and that the two sides should seek “ways to resolve it” – but the speech wasn’t made. Both will have some facts in their minds, primarily that each country needs the other economically. There are about 100,000 Russian-speakers in Germany. Some 6,000 German companies operate in Russia. Germany does take about a quarter of Russia’s exports of natural gas but, on the other hand, Germany’s stocks are currently high and prices are low (so Russia needs the revenue more than it did when prices were high). On the other hand, Germany’s trade surplus with Russia is substantial. Germany exports about 2.1bn euros (£1.7bn; $3bn) more in goods to Russia than the other way round. No country has benefited more from the fall of the Iron Curtain than Germany. It has gone from being a divided country on the eastern edge of the EU to a united country bordered by former Eastern Bloc states whose economies are now improving within the EU. The country is the central power among a clutch of former Soviet satellites (including East Germany itself) where people may be wondering what a belligerent Russia in Ukraine means for them in Warsaw or Prague or in the Baltic EU capitals of Vilnius, Riga and Tallinn. Their concerns are also felt in what used to be East Germany – where Angela Merkel grew up.